"A cucumber should be well sliced, and dressed with pepper and vinegar, and then thrown out, as good for nothing," offered 18th-century author Samuel Johnson. Johnson’s commentary on the cucumber came well before selective breeding had eliminated much of the bitterness of the vegetable. The author also was lacking current knowledge of the considerable benefits of the now-mild tasting cucumber. The cucumber is a source of slow-release energy and a potent tool in your efforts to lose weight. Although the cucumber is famously held in high regard by the British, its early history lay in the Mediterranean region, where Greeks, Romans and Egyptians cultivated it since about 4000 to 3000 B.C. The cucumber migrated up to France and eventually to England by the 1300s. It was brought to the New World by Christopher Columbus and has made its way across the globe, appearing in cuisines around the world in salads, sandwiches, salsas, relishes and sauces, such as Indian raitas and Greek tzaziki. A member of the squash family and cousin to zucchinis and watermelon, the cucumber has never attained the status or popularity of other vegetables that are eaten raw, such as lettuce, celery and carrots. Set aside whatever bias you might harbor, however. It’s time to invite the lowly cucumber to your daily plate, especially if you are trying to lose weight. Just as you may think of solar or wind power as providing clean energy, you can think of the cucumber as providing clean energy to your body. The cucumber is unencumbered by the negative nutritional qualities you can find in many of the foods that are probably lurking in your refrigerator and cupboards. An 85 gram serving of cucumber, about ¾ of a cup, has a mere 11 calories. It has virtually no fat, cholesterol or sodium. It has 2 grams of carbohydrates and 1 gram of sugar. Dieters can find much to love in the lean caloric profile of cucumber as few foods have fewer calories than the cucumber. Even romaine lettuce and celery, which have 14 and 12 calories, respectively, in an 85-gram serving, have more calories than a cucumber. Although slim on calories, the cucumber manages to offer good nutrition. It is an excellent source of vitamins A, C and K, folate, potassium, and manganese, and it is a good source of riboflavin, pantothenic acid, calcium, magnesium, phosphorus and vitamin B6. The cucumber offers about 0.5 gram of fiber in an 85-gram serving. This bit of fiber helps slow the release of the few calories in cucumber, stabilizing blood sugar and sating your appetite. The slow release of calories means your body has energy available to it for a longer period of time. This might seem like a small amount of fiber compared to other vegetables, but there is a reason for this. A cucumber is almost 97 percent water by weight, according to the U.S. Department of Agriculture. This means that when you eat cucumbers, you are mostly consuming water with a little bit of fiber, slow-release energy and some decent nutrition. Your body benefits from the hydration and the water quells your appetite. Perhaps you are thinking that the cucumber could be the perfect diet food, if only it tasted not like a cucumber but more like onion rings or chocolate. However, the mild flavor, texture and adaptability of the cucumber make it an ideal ingredient in several dishes that offer up diverse flavors and textures. 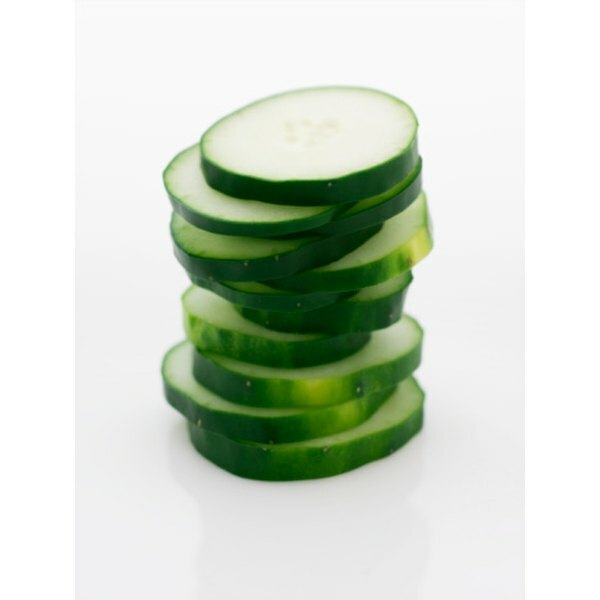 Add sliced cucumber to your salads or sandwiches and wraps for vitamins and crisp bulk. Make cucumber salads, mixing equal portions of cucumber and fresh tomato along with half portions of green pepper and onion. Top with low-calorie, fat-free Italian dressing. Try the cucumber raita recipe described at IFood. Raita is a popular Indian condiment made of cucumber, yogurt and cumin that serves as a cool contrast to spicy curries. It’s time to stop neglecting this ally in your efforts to curb your appetite and drop those pounds.